On a balmy November evening in Mumbai, I ease into my seat at Sion’s gigantic Shanmukhananda hall for a treat. Franz Osten’s 1928 silent masterpiece Shiraz has been painstakingly restored over the years by the British Film Institute, and I am witnessing a special screening accompanied by live music written and performed by Anoushka Shankar and her ensemble from London. The film is spectacular, even after 90 years! Agra, where it is shot, looks ethereal and the battle scene with a cast of literally thousands leaves me awestruck. In the Bahubali-era of special VFX it is easy to be dazzled, but to think that they made Shiraz back then…wow! From a brilliant restoration to a brilliant remake — I have an equally-wow experience when I see Goopi Gawaiya Bagha Bajaiyaa — Shilpa Ranade’s animated ode to Satyajit Ray’s classic Goopy Gyne Bagha Byne. 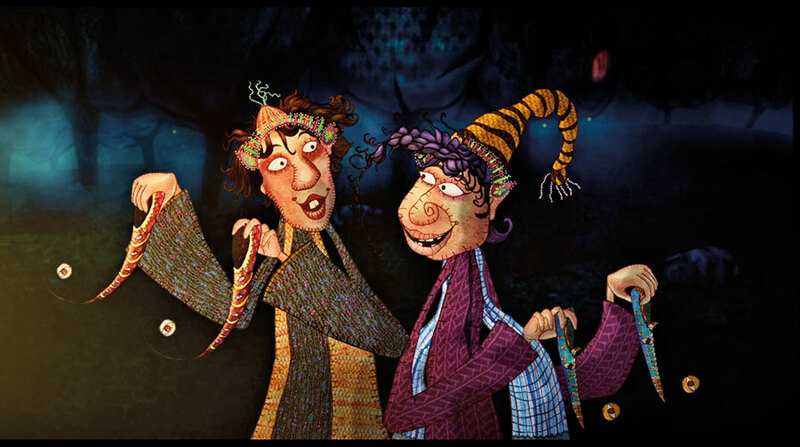 Goopy and Bagha are characters created by Satyajit Ray’s grandfather Upendrakishore Ray Chowdhury, and we screened their latest adventures at our India Culture Lab to a packed audience of children and parents who were laughing and crying alongside the so very desi story. Now, I am all for the Doraemons and Shinchans of the world, but there’s also so much we have in our own culture, and I’m glad that bodies like the Children’s Film Society of India which produced this film, are making the efforts they are, to get us to appreciate the cultural treasure trove that exists right on our doorstep. Continuing with the old becoming new storyline, I got a special preview of Delhi-based St+Art India’s latest urban art project — this time at the 142-year-old Sassoon Docks on the southern-most tip of Mumbai. The Sassoon Docks are actually where our megapolis has grown from over the years, but for most residents, even those that live around the area, they have been invisible and inaccessible. All this has changed with the exciting intervention of the Sassoon Dock Project. This is a mini biennale of sorts, on till December 30, with site-specific installations, murals, audiovisual experiences, screenings, performances and talks, by 30 Indian and international artists and performers. When I visited three days before the opening night, St+Art’s founder Hanif Kureshi was frantically rushing around a giant crane — trying to finish his installation. 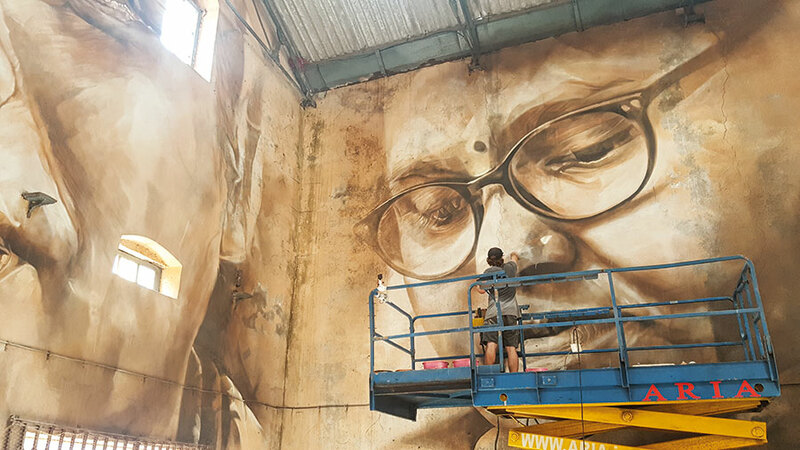 So I quietly walked around, watching Dutch artist Guido van Helten make giant murals of Koli women on the walls of a two-storey warehouse. 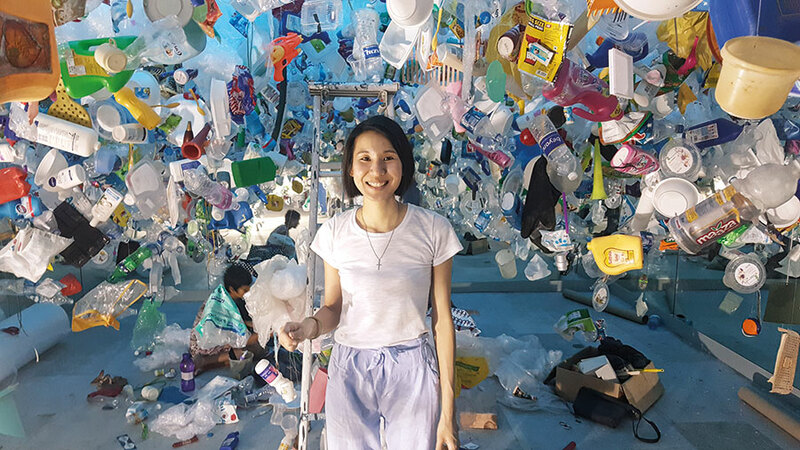 Then I chatted with the ebulient Tan Zi Xi from Singapore as she put the finishing touches to her plastic sea installation in one of the darker rooms of the same warehouse. Her set piece is meant to give you the feeling of being underwater, like a fish, and seeing what humans have done to your home. Please go and swim in it yourself, to get the full experience! Meanwhile, good old Sameer Kulavoor had done something very cool on the mezzanine floor of the same warehouse. Sameer’s art idea is to package the all-pervasive fishy smell of Sassoon Docks as an imaginary perfume brand called Parfum Sassoon, and his on-site installation is essentially a brand showroom complete with perfume boxes you could take home with you — filled with the air of Sassoon Docks! So clever, na? I loved! Many of the artists at the festival engaged deeply with the local Koli community that live in and around the Sassoon Docks area as a build-up to their installations. St+Art’s content director Akshat Nauriyal, for instance, built a pop-up studio and over the course of a week, clicked more than 150 portraits with his assistant Pranav Gohil. 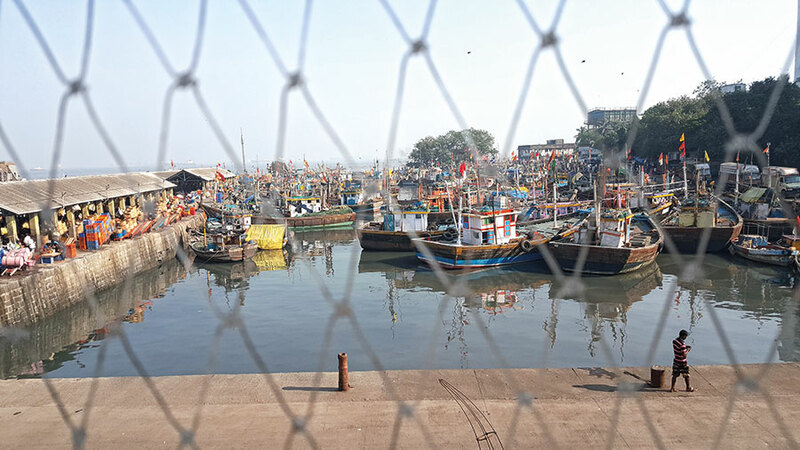 These portraits were then blown up to large-size prints and when you visit, you can see them pasted across the dock as a tribute to the resilience of the Kolis who were the earliest settlers of the city, and, even today, are the source of most of the fish that Mumbaikars eat. As I walked around the different installations, I thought of how the trend of upcycling is not just for clothes, but for art and architecture too. The first flush of modernity means you want everything to be shiny and new. Then as you mature, you realise that there’s value to be had in the old. We are experiencing that now as a country. Whether in our cities or in our culture, we (or at least some of us) are coming to realise that wisdom lies not in effacing the past but in appreciating how newness is always built on the structure of the past. Our heritage hotels have gotten it right for many decades now — some more than others. Here I’m thinking of Rajasthan’s Raas Jodhpur, which merges 18th century haveli aesthetic with contemporary luxury perfectly, and has even extended the hipness to the stepwell square outside, with its chic boutiques and cafes. The Kochi-Muziris Biennale has also got this old-new balance perfectly — which is why it is a hit, as is Tasneem Mehta’s Dr. Bhau Daji Lad Mumbai City Museum, which fits in exciting contemporary art programming (Sudarshan Shetty’s Shoonya Ghar is on right now) into its vintage building and glass-covered ‘people of Mumbai’ tableaus. Likewise, the transformation of Delhi’s Bikaner House over the past two years has been astounding. I’m glad that organisations like St+Art are continuing with this trend, and more importantly, old city behemoths like the Mumbai Port Trust, which actually owns Sassoon Docks, are coming on board to allow such wonderful reconfigurations. Soon you will usher in a new year, dear readers. I want you to think about this in the midst of all the partying — when 2018 comes, will you efface the past and build completely new, or rather will you in some creative way, preserve what has gone by, and build upon it beautifully in the times ahead?